Thank you, thank you, thank you!!! A wonderful and special day that couldn’t have happened without all of you! Mitchell and Maggie and Madi were so fantastic!! Love the venue and the people, JJ and I are so grateful!! I would highly recommend this venue for any wedding/reception/party or large corporate event – amazing! I would not have changed a single thing about the entire process with them. We had our wedding at Church Ranch Event Center last weekend and it was PERFECT! Eric did a fantastic job scheduling everything throughout the day and making sure we were happy. I would not have changed a single thing about the entire process with them. They made it so easy to plan especially because we were out of state in the beginning. Madi also went out of her way to answer all questions I had in a timely manner and was so sweet about everything. They do not have just an okay list of vendors; they are the best of the best. The grounds are incredible and so well maintained. Thank you Church Ranch Event Center and all staff! Perfect location for our wedding day! The Church Ranch Event Center was the perfect location for our wedding day! It was beautiful in early spring with a rustic, garden feel to it. Eric and Coco were great to work with on all of the big and little details prior to the wedding day, and Julie and Renee were awesome with helping the rehearsal and actual wedding day to run smoothly. I would highly recommend this venue to couples! Such an awesome venue!!! Eric and the rest of the team made sure everything turned out perfectly for our wedding. 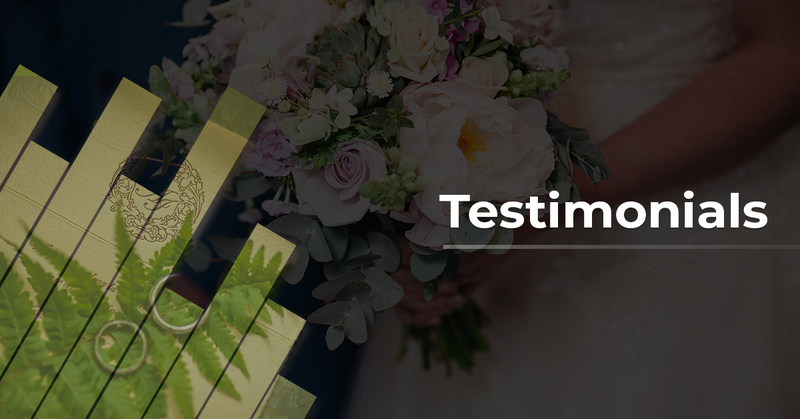 We were very particular about a lot of the small details, but and they happily accommodated all of our requests and helped make our wedding day very special. This venue is beautiful and there are so many nice areas to hang out in. We definitely recommend using the lighting package for the event hall, it added a great ambiance. We highly recommend Church Ranch Event Center! My husband and I shot a wedding at Church Ranch Event Center this past weekend and absolutely loved it. They have EVERYTHING! Great place for an outdoor ceremony with a backup gorgeous indoor location, great spot for reception, amazing trees and plants all around the property, and lots of open room for cocktail hour and games if you’d like. I’ve shot over 300 weddings and I have to say this was definitely one of my all-time favorite locations!! I met Eric during a bridal expo back in January, we were trying to find somewhere that could fit everyone, allow our own catering, had inside and outside possibilities, and was in our budget. I had already seen a few places but none of them had that ‘feeling’. We made the appointment to check out CREC that next week, the minute I walked in, I had it- the Feeling. The inside reception hall is open and airy, the bar is beautiful, and it had that classy rustic look we were looking for. Outside was even better, even though we were seeing it in late January, it was still just what we were looking for- open, filled with trees, and plenty of lawn space for games. They checked off every point on my checklist, I paid the deposit that day. Fast forward ten months to the actual wedding week- Coco answered every random question that my mom and I had, all in their own email or phone call of course, without ever making us feel like we were bothering her. They were reassuring through the whole process and even allowed us to change decoration/table settings up until the day before. The outside landscape was absolutely gorgeous, everybody talked about, there wasn’t one bad word said. The aspens were perfectly yellow, flowers were all blooming, and the grass was a beautiful green. It was just what I had imagined for the last year. On the actual wedding day, it was wonderful not having to worry about anything. They provide an Event Manager who is in charge of timing, flow, and that everything is in the right place. I was able to enjoy the day without knowing if anything went wrong. The price is a good value, there will be small costs that add up- but if you look through the invoice with them each time and pay attention, they’re willing to take things out or change them up until two weeks before. There’s a lot of freedom in what you can do with this space, many venues don’t allow too much outside thought and are very strict with outside vendors (caterers/DJ/etc), these guys allowed a friend of mine to cater the whole thing with no extra charge. I would highly recommend this venue to anybody looking, the value is solid, and Coco and Eric were a joy to work with! Couldn’t have picked a better venue. The indoor and outdoor spaces make you feel like you are miles away from the city. It was even better that our whole event from ceremony, cocktail hour, to reception were all in one location. Eric and Spencer were easy to work with and really helped us figure out all the details. Church Ranch Event Center was the perfect location for our wedding July of 2015. Coco and Eric were very helpful from the beginning and always available to answer my questions. They were willing to do whatever they could to make our day special, including ordering several gallons of milk for our cookie and milk dessert table! All of the staff at Church Ranch are willing to make your wedding day or event a very special time for all guests. The grounds are absolutely stunning and well maintained. This event center is truly a diamond in the rough. Several of my guests from the area who had not been to Church Ranch before commented on how beautiful the gardens were and how lovely the indoor reception was. The ambiance is perfect! The backdrop of our wedding ceremony was beautiful, tall aspen trees which looked stunning in all of our photos. For the typical Colorado couple like enjoys our great outdoors, this is the perfect venue for you! Church Ranch Event Center did an amazing job at hosting our wedding ceremony/reception! The staff was very polite & helpful throughout the whole process which in the end made for a stress free day ? The coordinator Julie was awesome during the rehearsal as well as the day of. We loved that it had a rustic look to it & the gardens are amazing…lots of photo options. We would definitely recommend this venue to others!